Dr. Rita Colwell, director of the U.S. National Science Foundation (NSF), and Dr. Catherine Cesarsky, director general of the European Southern Observatory (ESO), today signed a historic agreement jointly to construct and operate ALMA, the Atacama Large Millimeter Array, the world's largest and most powerful radio telescope operating at millimeter and sub-millimeter wavelengths. "With this agreement, we usher in a new age of research in astronomy," said Dr. Colwell. "By working together in this truly global partnership, the international astronomy community will be able to ensure the research capabilities needed to meet the long-term demands of our scientific enterprise, and we will be able to study and understand our Universe in ways that have previously been beyond our vision." Dr. Cesarsky also commented, "This agreement signifies the start of a great project of contemporary astronomy and astrophysics. Representing Europe, and in collaboration with many laboratories and institutes on this continent, we together look forward toward wonderful research projects. With ALMA, we may learn how the earliest galaxies in the Universe really looked like, to mention but one of the many eagerly awaited opportunities with this marvelous facility." When complete in 2011, ALMA will be an array of 64, 12-meter radio antennas that will work together as one telescope to study millimeter and sub-millimeter wavelength light from space. These wavelengths of the electromagnetic spectrum, which cross the critical boundary between infrared and microwave radiation, hold the key to understanding such processes as planet and star formation, the formation of early galaxies and galaxy clusters, and the detection of organic and other molecules in space. The ALMA partners will construct the telescope at an altitude of 16,500 feet in the Atacama Desert in the Chilean Andes. This unique site is perhaps the best location on Earth to study millimeter and sub-millimeter light because these wavelengths are absorbed by moisture in the atmosphere. "Astronomers will have a pristine view of that portion of the electromagnetic spectrum from the ALMA site," said Colwell. ALMA is a joint project between Europe and North America. In Europe, ESO is leading on behalf of its ten member countries and Spain. In North America, the NSF executes the project through the National Radio Astronomy Observatory (NRAO), which is operated under cooperative agreement by Associated Universities, Inc. (AUI). The National Research Council of Canada will partner with the NSF in the North American endeavor. "The NRAO is very pleased to have the leading role in this project on behalf of the North American partners," said Dr. Fred K.Y. Lo, director of the NRAO in Charlottesville, Virginia. "ALMA will be one of astronomy's premier tools for studying the Universe," said Nobel Laureate Riccardo Giacconi, president of AUI. "The entire astronomical community is anxious to have the unprecedented power and resolution that ALMA will provide." The President of the ESO Council, Professor Piet van der Kruit, agrees: "ALMA heralds a breakthrough in sub-millimeter and millimeter astronomy, allowing some of the most penetrating studies of the Universe ever made. It is safe to predict that there will be exciting scientific surprises when ALMA enters into operation." By signing this agreement, ESO and the NSF give the green light for the joint construction of the ALMA telescope, which will cost approximately $552 million U.S. (in FY 2000 dollars). To oversee the construction and management of ALMA, a joint ALMA Board has been established by the partners. This board met for the first time on February 24-25, 2003, and witnessed the signing at the NSF headquarters in Arlington, Virginia. Dr. Joseph Bordogna, deputy director of the NSF, represented Dr. Colwell at the actual ceremony. Chile, the host country for ALMA, has shown its support for the telescope by issuing a Presidential decree granting AUI permission to work on the ALMA project, and by signing an agreement between ESO and the government of the Republic of Chile. These actions by the government of Chile were necessary formal steps to secure the telescope site in that country. ESO is an intergovernmental, European organization for astronomical research. It has ten member countries. ESO operates astronomical observatories in Chile and has its headquarters in Garching, near Munich, Germany. 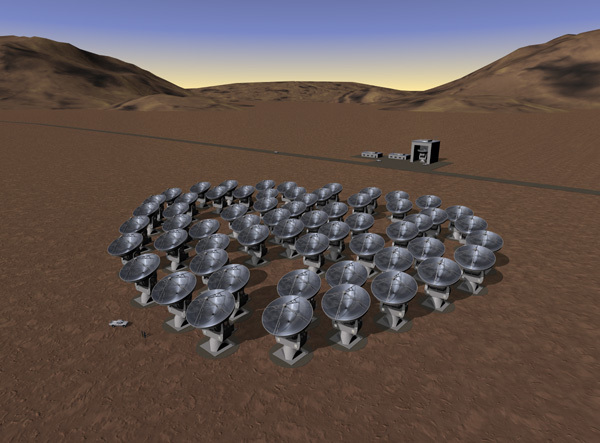 NOTE: A background document on ALMA is available in pdf format.